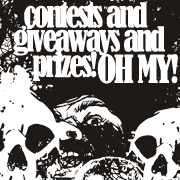 This Side of the Grave ARC Giveaway! Today marks 19 days to the highly anticipated release of This Side of the Grave. Because we know you are dying to get an early copy of this book, we’re giving away our lovingly USED Frostfans.com moderator ARC copy! To enter, all you have to do is leave a comment below answering the following question. What kind of Valentines Day gift (flowers, candy, stuffy, other?) would you give your favorite Night Huntress character? Please keep answers PG! 1 entry per person. Additional entries will be deleted. Contest begins at 3:00 p.m. PST on February 2, 2011 and will end at 2:59 p.m. PST on February 8, 2011. To leave a comment on the blog, you must be a member but registering is quick and easy. Posts are encouraged but will not be judged. Winning entry will be selected by randomizer.org. This Side of the Grave releases February 22, 2011. Pre-order your copy through our Amazon shop and help support this site! Poor Tate is so uptight it might just help him a little. I would love to win this! I have to re-read from the beginning when they first meet too. Bones would not want for anything if I was buying presents for him. Lucky lucky Kitten!!!!!!!!! I would give Ian a puppy to keep him company when, um, I couldn’t be around. I think he’s actually very lonely and a dog would be a great companion. I’d give Bones a gift card to a fetish wear store! I”d buy Justina a Rodney ghoul stuffed animal so she could snuggle it at night. I would give Cat a handmade box of Bones’s blood chocolates. I give Bones Everything. Yeah, thats a capital E. Nothing fancy, just Everything. To the entire cast of characters……… resurrect Timothy…….what a sweet treat that could be….. I would make dinner for Rodney and we all know what he eats. Chocolate Covered Strawberries. When you give them to someone, that means you really, really love them, because who in their right mind would give away chocolate covered strawberries? w00t! Thanks again for another chance to win. I’d get Cat a blood vial necklace (http://www.vampirewear.com/item_354/008–BV–Blood-Vial-Celtic-Knots–Lovers-Vampire-Gift-Set-Chains.htm) so she can keep a bit of Bone’s blood in it in case he’s not around and she wants a snack. I’d special order it so it’s not silver. And I’d also give her a bloody Gloomy Bear (http://www.gloomybearstore.com/Gloomy_Bear_Plush_Black_Bloody_Six_Inch_Figure_p/603079-000.htm) because I think she’d get a kick out of it. I would gives Bones a wedding band with an inscription that says my heart on it. I would give Bones …hmm maybe not Cat would hurt me. Tate it is. I would give Tate … advice he really needs to let Cat go… it is NEVER going to happen. I’d take Ian as my Valentine. I’d probably attempt to find him some antique artifact for his collection, fail miserably and then just go with a large quantity of alcohol and a home cooked meal. I would take Spade as my Valentine…… I would tie myself up with a big red bow with a glass of wiskie in hand waiting in his bed. Because I love Bones and know that Cat is his everything – I’d give him her with no distractions or worries about anything but each other for the entire day. I would give to C&B the opportunity to relive their first kiss, since all lovers would like to make it ! I would love to share Valentines Day with Ian. I would give him a special chocolate stud to replace his special down under piercing for one editable delicious night. I would give Juan a new little black book filled with names and numbers of female vampires. I would give Cat and Bones more uninterrupted time with each other since they never seem to get enough. I would buy Bones a bottle of chcolate syrup. I’m sure he’ll know how to use it. I would arrange it so Bones could take Cat on a week getaway so they can spend some uninterupted time together. =] God knows they need it! I would arrange a trip to a private island for Ian and myself! i would give bones and cat a vacation so they can have some time alone… maybe even a big bottle of chocolate syrup so the can have even more fun on Vday. I would give Tate a love all his own. I would give Ian one of those cute little monkeys. He would be trained to pick locks and steal things. I feel that Ian would appreciate my gift and get along smashingly with his new friend. I would love to win this book, ANy adult books i win are donated to the Middletown High school staff for passing around after the release date. So many good gifts already. Ok, to be slightly different, other than my undying love, I would give Cat & Bones my computer skills to use as needed when needed. OK to keep it PG….I would give Spade (my favorite!) a gift card to Bath & Body Works so we could go buy some fun shower stuff to lather up with!